What I found most impressive about “Collateral Beauty” is the fact that each actor gets his or her moment in the dramatic spotlight. This week, Warner Brothers released to Bluray & DVD "Collateral Beauty", which was released in theaters back in December of 2016. This picture is headed by Will Smith, who recently seems to step away from his big summer blockbusters here and there in the search of that elusive Best Actor Oscar. The sad part is, he's deserved it many times over! "Ali", "The Pursuit of Happyness", "Legend of Bagger Vance", and, for me, his role in "Seven Pounds" was truly heartbreaking. I often wonder if the situation is that some people have a hard time not seeing the charismatic cocky bad boy when they see these pictures. I mean really when you think Will Smith what comes to your mind? Is it the "Welcome to Earth" "Independence Day" Will? Or is it the "I make this look good" MIB Will? Could it be Mike Looowreeey, the bad boy himself? Will Smith is the summer blockbuster actor we all LOVE to watch! We want to see him knock down the bad guys and win the day. But does the public want to see Will be vulnerable? Does the Academy? Or is there the slightest possibility that they just might not want to give him the Oscar since he already has a hold over summer blockbusters and it is rare that they ever give credit to one of THOSE! Even "Suicide Squad" proved that he could still carry a blockbuster to Epic proportions. Well, you can argue that till the end of time. But time is finite, and we must move on. We all long for Love. We wish we had more Time. "Collateral Beauty" is the story of Howard, the optimistic guru in charge of a booming advertising agency, who loses a child and can't come back from the depressing abyss. Howard (played by Will Smith) is broken, his agency, after 2 years of him being absent from the helm, is going down and his co-partners are trying to find a way through. They have an offer on the table to sell the company but Howard won't sell. The partners, Whit (Edward Norton), Claire (Kate Winslet) & Simon (Michael Pena), set out with a plan to either bring Howard back to the world or find a way to get him to sell - but something has to give. The partners hire a detective who finds out that Howard is writing letters to deal with his grief. But the letters are to Love, Time & Death. Whit, after following an actress from one of their auditions to a run-down theater, meets 3 actors and comes up with the brilliant idea to have these three actors play Love (Keira Knightly), Time (Jacob Latimore) & Death (Helen Mirren) and answer Howard's letters. The idea is that if Howard had to confront Love, Time & Death in person, it might bring him out of his depression. As this all plays out, Howard finds himself attending a grief counseling session and meeting Madeline, the woman in charge of the group meeting. She also lost a child. She, too, tries to break the hardened shell that Howard has enclosed around him. This concept isn't new; the fact that this film is even set during the holidays should totally bring you right back to the three ghosts that visit Ebenezer Scrooge to show him the error of his ways. "A Christmas Carol", which was published by Charles Dickens almost 173 years to the day this film was released, has been remade in many forms. This film is a fantastic contemporary spin on the classic. In "Collateral Beauty", the "Ghosts" play a bigger role! I won't tell you the end, but I will tell you that if watch closely, you may just notice the collateral beauty. What I found most impressive about "Collateral Beauty" is the fact that each actor gets his or her moment in the dramatic spotlight. Of course, Will Smith is the main focal point but Helen Mirren playing death is just perfect! Edward Norton's character, while doing things that may be hard to swallow, comes off sympathetic and you can't hold it against him. Naomie Harris (Madeline) also puts in an amazing performance. And at the end of the day, I couldn't think of anyone better to play Love than Keira Knightley. I would totally start writing letters today if I thought she would show up to confront me with them! The Blu-ray Edition also contains a special feature entitled "A Modern Fable; Discovering Collateral Beauty". If you love Will Smith movies of all kinds, this, of course, is one that you will watch without question. If you're a fan of "A Christmas Carol" I would recommend it to you as well. Just be forewarned, it's emotionally heavy. Sometimes to the point of it all being too much. If you're a parent, this will definitely get to you. Personally, I loved it and give it 4.5 stars out of 5! Then again, Will Smith would already be an Oscar Winning Actor already if I had my way! 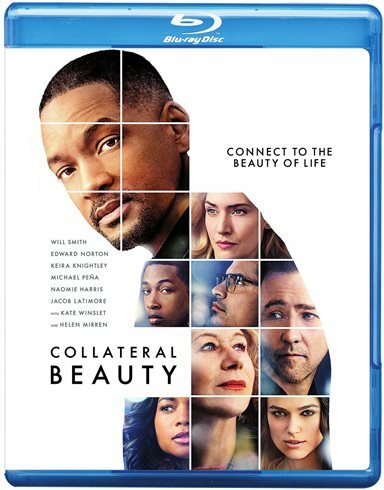 Check out "Collateral Beauty" out on Blu-ray & DVD today, keep your tissues out and don't let the dominos bother you too much. Download Collateral Beauty from the iTunes Store in Digial HD. For more information about Collateral Beauty visit the FlickDirect Movie Database.